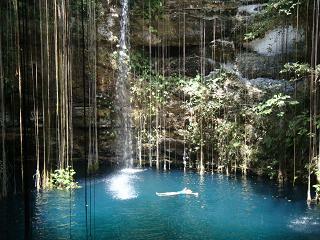 cenotes | Ashlie's Cancun Blog and other stuff! 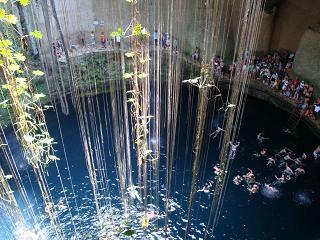 The last stop on our amazing Easter Yucatan Adventure took us to the cenote Il Kil. After checking out of our hotel we crossed the street and parked in the cenote’s lot just as two very large tour buses pulled in and a huge group of tourists descended from the buses, cameras in hand, rushing towards the very same entrance gate that we were heading to. We all handed our tickets in and were guided through the souvenir store en route to the cenote where luckily we lost about half of the people from the buses as they were waylaid by sales people trying to peddle ornaments, blankets and other keepsakes.We hurried along trying to lose the herd but quickly realized that the cenote was already full of people who had arrived on earlier buses. As we approached the steps leading down to Il Kil we stopped and first admired the view from above speechless. I had looked at videos on You Tube of Il Kil before we had decided to go but they couldn’t even begin to compare to the sight before us. 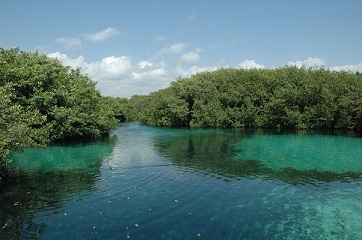 The crystal blue water, surrounded by vegetation was truly beautiful. 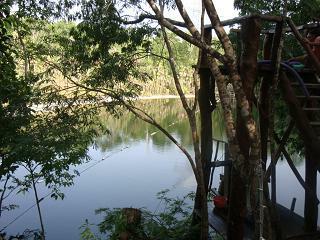 We made our way down the steps until we arrived at the cenote’s edge where we joined a crowd of shouting, pushy people. We stowed our belongings and dove into the cool water. Hubby felt cold after a while and wanted to dry off but I wasn’t ready to leave yet. As I floated on my back I suddenly became aware of a silence that enveloped the underground cavern. I looked around and to my delight realized that the majority of people had left. I imagine that they were called away to continue on their tour. I relished the silence and swam under the small water falls letting the water crash down over my face. As I surveyed the area around me I couldn’t imagine a more beautiful place, so serene and lush with vegetation and natural beauty. Finally, I made my way to the steps to get out leaving behind me a profound sense of peace that I had experienced while swimming in the deep clear water of Il Kil. We made our way to the parking lot and decided to stop for something to eat before heading back to Cancun. We came across a great little restaurant and ordered some local favourites. 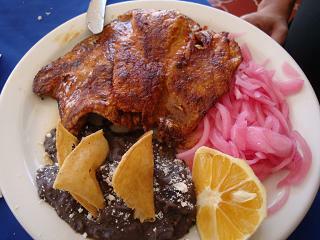 We started off with Loganiza ( seasoned pork meat sausage) with pickled red onion and then I had salpicon, (shredded deer meat with radishes, cucumber and seasonings) and Cesar had pork leg seasoned with achiote paste (annatto) and sour orange. The food was amazing!!! I only wish I could remember the name in order to recommend them. The restaurant was clean and the waiter was very friendly.It was the best meal of our trip. We headed for home feeling refreshed and relaxed and the topic of conversation on our drive back? Where should we go next? 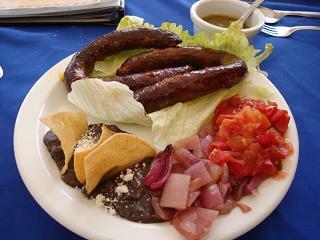 Cenote Chelentun, Bolonchojool and Chak-Zinik-Che..how’s that for a mouthful? 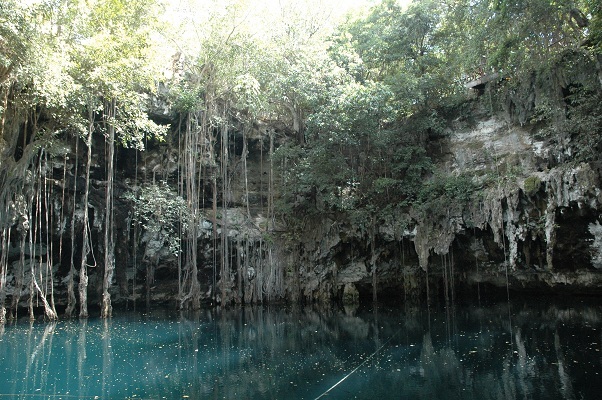 Continuing on from my last blog entry chronicling our trip to visit several cenotes in the Yucatan over Easter break I will pick up where I left off. We made our way along the path to a wooden staircase leading down to the first cenote, Chelentun,where we were greeted by a huge group of people all toting their cameras and swim gear. 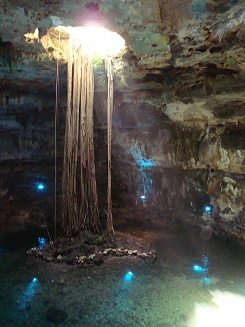 Once down the stairs I peeled off my clothing and amidst flashing cameras I dove into the cool crystal blue water.There was a beam of sunlight shining down from an opening above which lit the cavern up and enabled you to see the bottom though the cenote was quite deep. There were stalactites hanging down from above which added to the beauty of this natural wonder. After swimming for our alloted 30 minutes we took a few pictures and returned to our cart.On our way to our next destination we had a bit of excitement as our cart derailed and Luis and Jose quickly mounted the cart once again onto the tracks and we were off again!. We arrived at Bolonchojool unscathed and Luis told us that this particular cenote was a favourite among visitors to Cuzama. 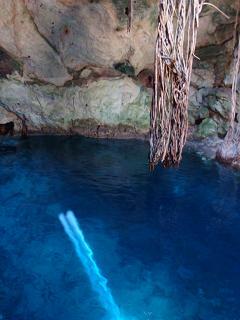 We walked to the cenote’s entrance which consisted of a small hole reminiscent of Alice and Wonderland’s rabbit hole. 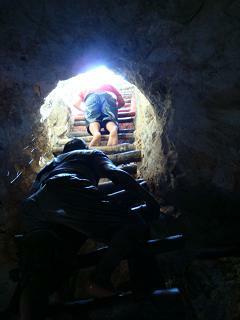 It had a makeshift wooden ladder burrowing deep into the earth. There were people trying to go up and down it at the same time even though there was room for only one person at a time…you gotta love Mexico! I gingerly made my way down encountering steps that creaked and buckled under my weight—eeek!Once I arrived ,again there was a large group of people but I easily ignored them as I was captivated by Bolochojool’s incredible beauty. Amidst stalactites and beams of natural light I again stripped down and swam lost in the purity of this underground world. Our last stop on this incredible tour was centote Chak-Zinik-Che. Another beautiful spot where once again we swam and snapped a few photos. Then it was time to board our cart for the trip back which involved stopping the cart and taking it off the tracks when 2 or more other carts came our way as there were only one set of tracks going to each cenote. I was amazed at how efficient our guides were and we were quite amused by the whole experience. As the other carts sped past the Pony Express came to mind. Once we arrived at the entrance I took an apple out of my bag and offered it to Pirata who sniffed it and turned his nose up at it!! My family has a guest ranch and I have never seen a horse who didn’t love a fresh green apple. I tried giving it to one of the other horses and they too declined.Jose told me that they didn’t like apples…I imagine that they have never been offered one before that day. We thanked our guides and made our way to our truck it had been a truly amazing experience.We were hungry and thirsty so decided to look for a place to stop before driving on to Chichen. We came across a sign for a place called Hacienda Tepich. We followed the signs and were quite surprised when we arrived at an actual Hacienda. I will leave that for another day and another blog.I hope that you have enyoyed reading about our Easter Yucatan Adventure so far.I would love to hear your thoughts. As I mentioned in my previous blog my husband and I decided to get out of Cancun on Sunday and visit a few cenotes in the Yucatan. There are many cenotes scattered all over the Yucatan and Quintana Roo and gradually through the years we are getting to know them all. 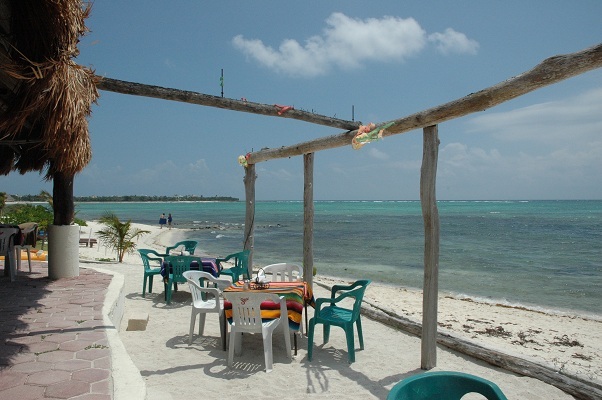 We had originally planned to leave Cancun Sunday morning and go to Chichen Itza to visit Il Kil cenote then spend the night in Chichen and on Monday visit Cuzama and then make the long drive home. Hubby wisely suggested that we visit Cuzama first and then drive to Chichen and spend the night and then go to Il Kil the next day. 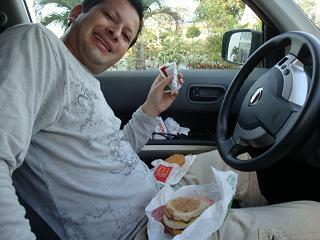 We wanted to get an early start so we planned to be on the road by 6am and we made a quick pit stop at McDonald’s and had breakfast on the road…not a very healthy way to start the day, I know, but it was convenient. We turned on the radio and much to our dismay heard that it was actually 7am and not 6am as the clocks had gone forward 1 hour and we had forgotten–damn…one hour lost. We had anticipated a 4-4.5 hour drive to Cuzama but we were pleasantly surprised to arrive after only 3.5 hours; however, I was none too pleased that we had already spent about $40 CDN on toll highways and consumed 1 tank of gas! We passed through a town called Acanceh on our way to Cuzama hubby and I were quite amused to see their “taxis” which were small motorcycles attached at the back to a box like structure with a seat. It reminded me of the “tuk -tuks” in Thailand except the motorcycles are in front and the ones in Acenceh were much more primitive. http://www.into-asia.com/Bangkok/tuktuk/ Hubby was using our Flip recorder to catch all of the sights as we slowly made our way through town to Cuzama. Once we arrived we were greeted by a gentleman who explained to us what to expect on out visit. 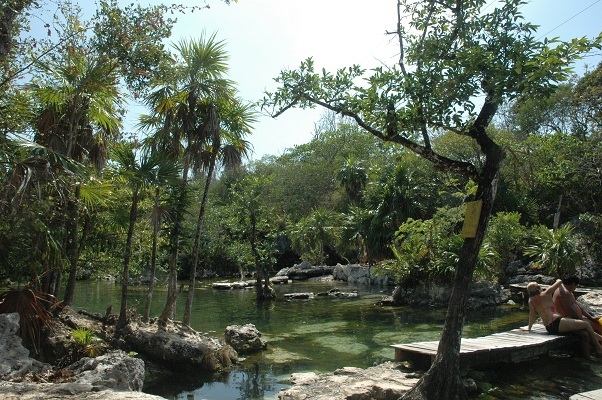 Normally the tour of the 3 cenotes takes 2.5 hours but because there were so many people due to Semana Santa they had extended it to 3 hours. 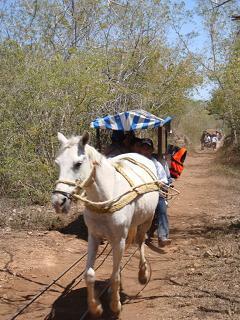 The cost was 200 pesos (about $17 ) for our guided tour on a horse-drawn cart along an old railway track. Our guide, Luis Antonio, and our “driver” Jose ushered us onto our cart to begin our journey with our horse Pirata (Pirate) leading the way. I asked Luis about the railway tracks and he informed me with a nostalgic look that when he was a young boy his father and his father’s friends used to cultivate “milpa” corn and they put the crude railway tracks down to move the corn from the fields into town. After many years of almost drought like conditions they were forced to seek work in Merida to support their families and they had to give up their families’ business. Now many years later the tracks have been repaired and the carts have been adapted in order to carry both national and foreign tourists to enjoy the natural wonders of that area. We arrived at our first cenote Chelentun after a rocky ride along the tracks that involved Luis stamping his foot down along the cart at every turn to keep us on the tracks…imagine Fred Flintstone driving techniques. Luis told us we had 30 minutes to explore. We excitedly left the cart and made our way along the path to the cenote.On that note I will end this blog and continue it on another day soon. 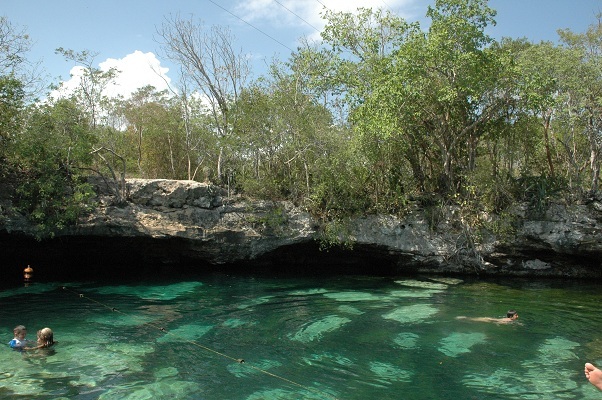 Las Mojarras Cenote–instead of the beach! I haven’t been feeling very bloggy lately and I guess that could be attributed to the fact that I haven’t really done anything that interesting for awhile to write about here so I decided to look through some of my photos and see if anything inspired me. 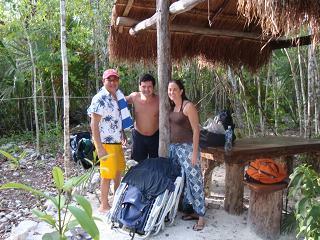 I came across a small file of when my husband and I and Erika and Freddy went to Las Mojarras Cenote for the day..
We decided to go on a Sunday so after packing up our beach chairs, our cooler and bug spray (a must!) we set off in my truck for the day. Las Mojarras is about 35-40 minutes from Cancun and involves turning off the Ruta de Cenotes and onto a dirt road that cuts through the jungle in a zigzag route for the last 15 minutes of the drive. 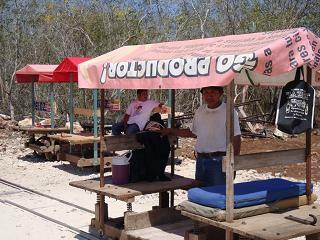 Once you arrive you are greeted by one of the owners and after paying about $12 (120 pesos – a local’s price) you are then taken to your own palapa with a view of the cenote. Be prepared to be eaten alive if you don’t take bug spray and insect coils that you must strategically place around your palapa and picnic table. We came packing enough bug ammo for a small army so after setting up we enjoyed a nice picnic and a game of dominoes. 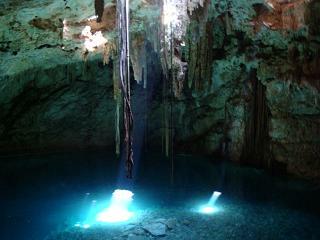 Then it was time to explore the cenote. 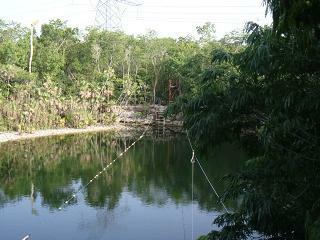 Las Mojarras have a zip line that goes across half of the cenote on one side and also one that goes across the other half on the other side. They also provide life jackets for those that need them as well as floating devices so that you can lay back and float around and enjoy the afternoon sun. You can also jump or dive off a high platform if you are so inclined…which Freddy and I both did! The water was very warm which is quite unusual for a cenote so we spent most of the day swimming, flying along the zip line and jumping into the water. A young German couple were also there with their two small children and we were amazed to see how fearless both the little girl and boy were and how much they loved jumping off the high platform. When the sun started to slip down the horizon it was time to pack up and make our way home to Cancun. 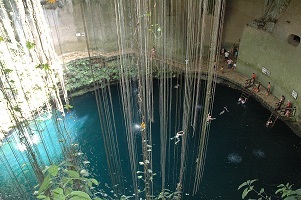 It had been a thoroughly enjoyable day and as I write this I am thinking that it is time to plan another day trip to Las Mojarras Cenote.